It's time for a new Sunshine Mail Foundation Challenge (October 15 - November 1). Our theme is "For The Girls" and the only real rule is that you send in at least one card (it doesn't have to be the card you enter in the challenge; Donation guidelines here). I printed the image and cut it out with a Spellbinders die in my BigShot. I also cut a light blue piece. The image is colored with Copic markers, and I added some details with Sakura glitter & gel pens. 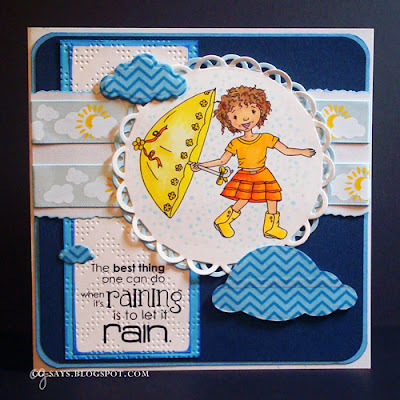 The clouds were cut with an IO die from blue paper covered with chevron-patterned Washi tape. The sentiment is by Paper Makeup Stamps; I won it some time ago, and I thought it worked so well with this image. I printed into onto a plain white cardstock, mounted it on a teal cardstock, and embossed it with the Charles Cuttlebug folder. I used double-sided tape to adhere the pretty printed ribbon onto a piece of shiny white cardstock that I edged with deckle scissors and a fluorescent blue Copic. I made this on a very rainy day; we didn't have much rain this summer, but so far, it looks like Autumn will be making up for that. I sort of like the rain, but I wish we could have a little sunshine at least once a day! Update: This won a "Top Tweet" mention at Songbird Challenges, as well as the prize for A Die for a Sketch #17! Very cute card. Love the layers and the pretty image. Awesome coloring as always. Two elements really drew my attention - the deckle edged paper with the strips of DP and the embossing on the sentiment panel... nice details CG! Thank you for sharing your project in the “Add Some Embossing” Challenge at Craft Your Passion. Beautiful card!!! Love image and dies. 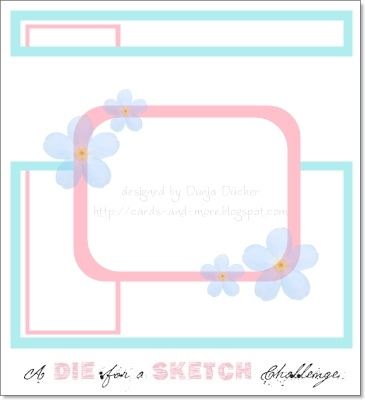 Thank you for joining us at A Die for a Sketch!